Relax on a chaise lounge and gaze at the spectacular mountain view, warm yourself by the fire or fill your day with outdoor activities. The options are many when you stay at Lakeside Pines. Midway between the towns of Saranac Lake and Tupper Lake, the location of our camp offers outdoor enthusiasts access to the Northern and Central Adirondack region. Paddle the St. Regis Canoe area. Hike dozens of state-maintained trails, be they rolling woodland walks or serious uphill challenges. Back at camp, sunbathe, swim off the beach or dock, or take out the row boat and cast your fishing line. From the sun deck, watch loons, kingfishers and heron dive for their dinner. Launch your boat at Saranac Inn's public boat launch, rent a boat at Hickock's or St. Regis Canoe Outfitters, tie up to our dock and then plan to explore Upper Saranac's many state-owned islands. Tee off at the Saranac Inn or Tupper Lake Country Club. Bathrooms have ceramic tile floors and shower walls. The master has a jetted tub, tiled shower and two sinks. The lake house sits only 40 feet from the lake. A 15 foot Grumman aluminum rowboat. Big Tupper Ski Area 16.6 miles away. Cross country skiing on the frozen lake at the front door. 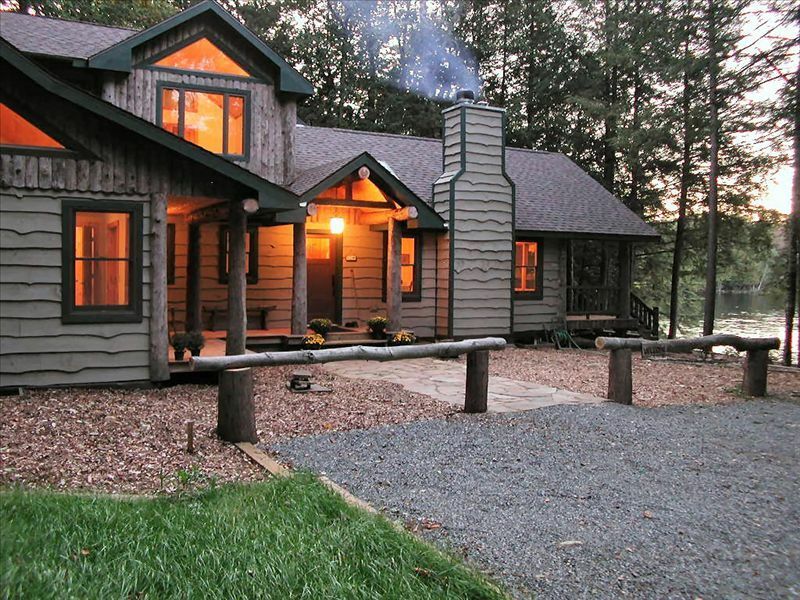 Wood Fireplace, Jetted Tub, Deck/Patio with Picnic table, Lakefront, Mountain View: Mt. St. Regis, Free Long Distance, 15' Grumman row boat and Two 17' Grumman Canoes, Minimum age limit for renters: Must have at least one adult over age 26. We had an amazing stay at this property. Beautiful location, well equipped kitchen and bedrooms, and designed for a large group. It has a rustic cabin feel but is also modern and very clean. Firewood was provided for the large fireplace which created a very relaxing environment for us. Our stay was during the winter (skiing and sightseeing around Lake Placid), but this would be an even better location for the summer since there is open access to the lake with a boathouse and canoes provided; plenty of area to fish and hike. I highly recommend this property. So much so that we already are booked for 2018 and 2019. This property has it all. From beautiful interior decorations to amazing breathtaking views. The neighbors aren't even noticeable, as they are quiet and home only on the weekends, and large hemlock trees block your view of their property. The lake is very specious and great for fishing and pleasure boating. Pike and bass can be caught almost anywhere, but stick to shallow water. I caught one 30" pike in only 2' of water. Check out the shallow weed beds on the West side of Goose Island for pike. We caught several 30"+ pike there. Square Bay is also great for pike and bass. Make sure you take time to visit Tommys Rock on the north end, where you can sunbathe and jump off of the rocks, as the rest of your party water skiis in the vicinity. There are loons everywhere you go , and as many can attest to, there are peaceful and relaxing to listen to. My 3 yr old son would imitate loon calls and the loons for then mimic any sound he made. He cried when we had to finally leave and we all shared the sadness of leaving this very special place. We couldn't have had a better summer vacation and we owe it to this property. We rented this house this summer- two families of four. The house itself is nice and well constructed. The kitchen is well equipped. The beds are ok, not particularly comfortable. The only issues I had were the proximity of this house to the neighbors- we come annually to the Adirondacks and had never been in a lake house that is so close to the one we rented in this price range. We could hear them talking, and we wanted our dogs (which we paid extra to come) to be able to swim as the Adirondacks is normally a very dog-friendly place but not these neighbors. I would recommend an alternative rental if you have dogs as they must be leashed all the time. Also, the view of the lake is of a bay. Not the open lake. If you are looking for a wide view, this home does not have one. Features like the outdoor fire ring were fun. Many families enjoy their stay at Lakeside Pines to such an extent that they come back year after year. In fact, they make their reservations in August of the previous summer to ensure they get the weeks they want. And many of these lovely people bring up to two dogs. So it saddened us to receive this vindictive review. In response, we note that these renters led us to believe that they were bringing two well-behaved dogs when they actually brought three, large undisciplined ones that were allowed to roam around our tranquil cove. Our neighbors are situated well away from our camp with plenty of privacy screening between us. On the other side of our camp, we have acres of state land for dogs to play and explore. Our own two dogs love it here. If you've ever rented on a lake, you know that voices carry over water. Everyone is entitled to have a good time .As for mattresses, we have spared no expense. We find them to be comfortable, but understand that preference varies among individuals. This was the quintessential lake house experience. Not a rental property, but a real vacation home, right down to the campfire with whittled marshmallow sticks! The house, the location, the little touches made it so much more than what we had hoped for. We celebrated my father's 80th birthday and it was a week of memories which none of us will ever forget. I wouldn't change a thing about Lakeside Pines! Up to two dogs are welcome. There is an additional refundable pet deposit of $250. Cats are not permitted since my wife is allergic to them.